Although a little long, I enjoyed watching the Parade of Nations during the 2012 Summer Olympics opening ceremony. 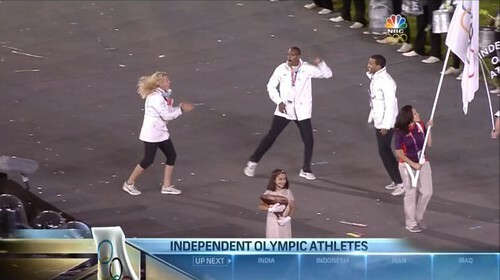 There are always a handful of nations I forget exist, and then there's the Independent Olympic Athletes. This year, the Independent Olympic Athletes are comprised of athletes from the former Netherlands Antilles and from the newly formed state of South Sudan. Liemarvin Bonevacia, Reginald DE Windt and Philipine van Aanholt are from the former Netherlands Antilles and Guor Marial is from South Sudan. After these Olympics, these three athletes from the former Netherlands Antilles can choose to represent either the Netherlands or Aruba. South Sudan has not formed a National Olympic Committee.